Supporters of the protest were calling it a “million man march,” although it was clear from numerous videos that crowds had gathered in some areas while others remained empty. Activists complained on Twitter that the government had cut public transportation links to the capital in order to lower the number of participants in the Friday protest. VOA could not independently confirm the claim. 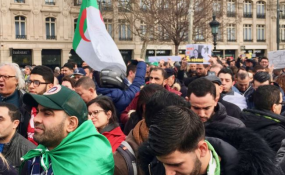 The Reuters news agency reported that Algerian security forces were blocking roads to parliament and to government headquarters. Incoming Prime Minister Noureddin Badawi told a press conference Thursday that he would name the members of his new government in the next several days. He said his new government should be formed by the beginning of the coming week and the next step will be to organize the national dialogue conference the government will oversee. Deputy Prime Minister Ramattan Lamamra told journalists that efforts are now underway to organize the national conference, under the auspices of veteran U.N. diplomat Lakhdar al Brahimi. Lamamra said there have been preliminary discussions to decide the agenda of the conference and it remains to be determined which parties and sectors of society will be represented. He said the people gave their final verdict, but the regime is ignoring the will of the people by proposing only a partial and temporary plan, even if it may have some good points. Said Qudari, a member of parliament and strategist for the ruling FLN party, told Al Hurra that critics should wait and see what changes will be enacted before criticizing the new government. Qudari said the new government will be made up of technocrats, and the new prime minister has proven his abilities in government for many years. He says change must take place slowly in order to find a solution to the current crisis. Islamist politician Abdallah Jaballah told a press conference several days ago that “the [Algerian] people must not surrender to the regime or believe its worthless promises. Algerian Army chief of staff Gen. Ahmed Qaid Salah has warned that “unknown elements are trying to pull down the government,” in a veiled allusion to the Muslim Brotherhood and other Islamist groups. Algeria fought a bitter and bloody civil war in the 1990s after Islamists won a 1992 election that was overturned.